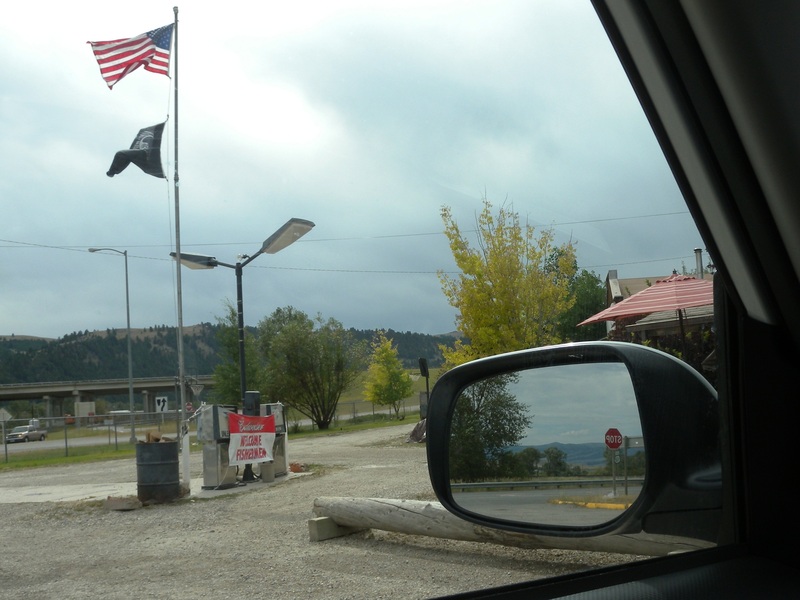 Linda Burton posting from Helena, Montana – Just an ordinary day in the life of a cross-country traveler. 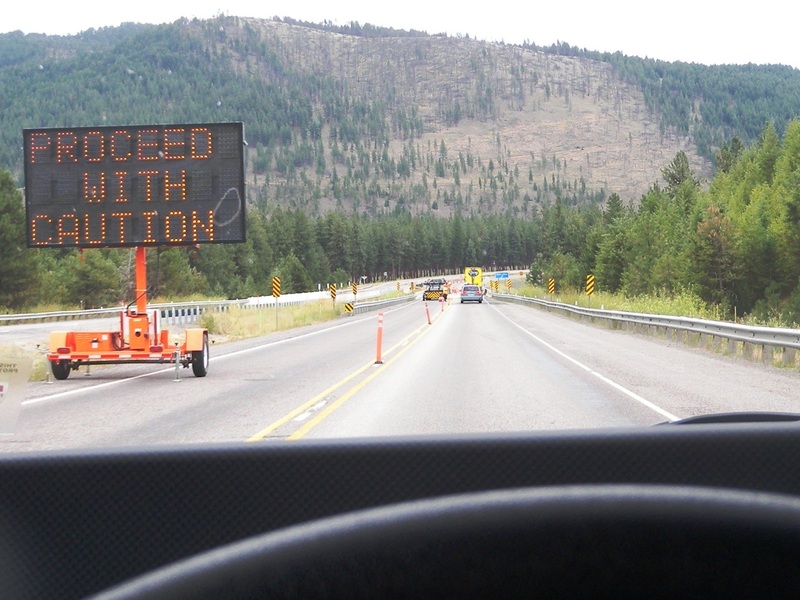 I crossed Clark Fork sixteen times, was slowed by orange road-work cones seven times, stopped for gas two times, and observed a smashed-to-pieces motorhome one time. Actually I saw the smash-up twice – once on the freeway at the scene of the “incident” (as the Montana temporary highway markers defined it); later when stopped at the St Regis Travel Plaza (where they serve huckleberry shakes). A truck hauled a piece of it in; I shivered at the sight, a shambles of dangling wiring, a sink poised in the upper corner as it lay pitifully on its side. What happened to the people? What happened to their dishes? What happened to their plans? Were they headed cross-country like me, or did they just want to spend a week parked by the creek, fishing peacefully? I gave a pat to my sturdy Scion, thankful we were safe. 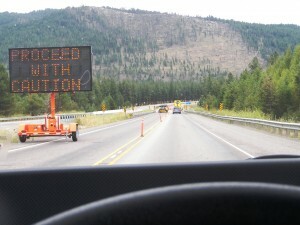 Montana has electronic reminders along I-90 asking the question: Are you mindful of the other driver? The roads are well-maintained (and vast amounts of maintenance and repaving are going on); yet I wondered at the 75 mph speed limit in the mountain curves. Once you leave Washington and start across the Idaho panhandle you hit mountain roads. Surrounded by a million Christmas trees, you are either going up or down, always on a curve. 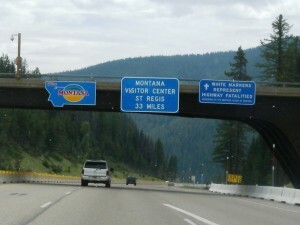 Lookout Pass slams you into Montana at 4,725 feet; you’re in the Coeur D’Alene Mountains, and the St Joe; you’re in the Lolo National Forest. The curves continue; there’s De Borgia, St Regis, Superior, at least you see their exit signs. It’s Rocky Mountain territory, and after Missoula it opens up a bit; the curves smooth out; the mountains turn from green to brown as trees sparse out; you spot a fishing stream. Again, and again, and again. You cross Clark Fork sixteen times! Clark Fork isn’t a fork of another river, by the way, it’s a river on its own merit, named for William Clark, explored by Meriwether Lewis on his return from the Pacific. It begins near Butte, winding its way in a northwesterly direction through the mountain valley till it gets to Lake Pend Oreille in northern Idaho, about 310 miles, in the watershed of the Columbia River. It’s a pretty thing (again and again!) and is one of the most popular destinations for fly-fishing in the United States, despite pollution problems from extensive mining. The Sapphire Mountains are to the right, the Garnet Range to the left; and then I see a sign announcing “Helena State Capitol Next Right.” Well yea! 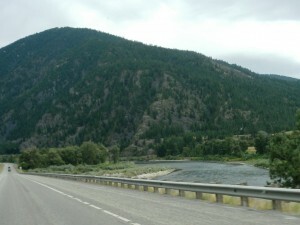 Highway 12, at the Garrison exit. I’m equally in need of gas and a rest room; there’s a pretty little store with pink petunia pots out front; an American flag flies over the gas pumps that are, to my surprise, covered with a cloth. “What happened to your gas?” I ask inside. “I ain’t sold no gas in 15 years!” came the gruff response. The proprietor spoke from behind a full beard, his well-worn felt hat rounding out the impression of “old codger.” “Why not?” I ask again, “what happened?” “Only communists sell gas,” was his answer. And that was that. I bought some Nutter Butters and a bottle of water; used the restroom, where the toilet seat was patched with duct tape. My host had walked around my car by then; he asked about my trip. “Are you really going to all them states?” he said, shaking his head. 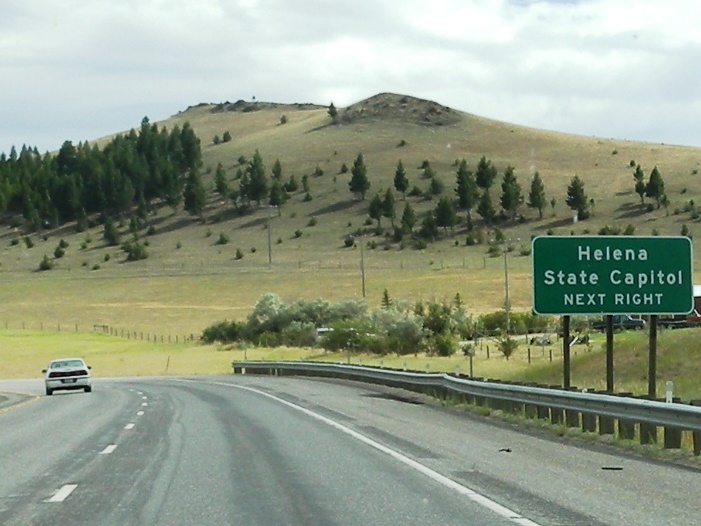 “Yes, I’m on my way to Helena now, it’s my eleventh stop. Do you like my car?” “Hmmph” was the muffled reply. 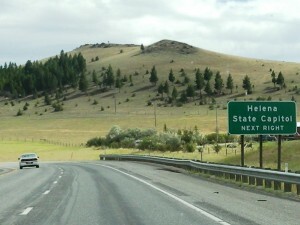 It was 45 miles on Highway 12 to Helena, over MacDonald Pass. Just downhill from the 6,320-foot summit, I crossed the Continental Divide. I’m back east now, so to speak. My rivers are headed for the Gulf of Mexico. 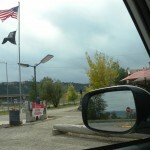 Note: I crossed the Continental Divide going west on March 17, 2012, on I-10 between Deming and Lordsburg, New Mexico. There was no gas available at the souvenir store there either.